Over the past few years, it seems bath bombs have been popping up at every skincare and spa retailer out there. With their soothing scents and fun fizzy effect, it's no wonder bath bombs are such a huge hit. But why waste time or money at the store when you can make your own bath bombs at home? Gather up a few common household ingredients, along with your favorite essential oils, and settle in for the best soak of your life with this simple DIY. In a medium size bowl, mix together all of your dry ingredients (citric acid, baking soda, and cornstarch) and set aside. If you’re using food coloring, now would be the time to add it into the dry ingredients. I found that using your hands is the way to go in terms of mixing. Start with just a few drops, and work up to the color intensity you'd like. In a separate bowl, combine your oils. While stirring, gradually add these to the bowl of dry ingredients. If you pour too quickly, the liquid will create a reaction with the citric acid. Use your hands to knead everything together inside of the bowl until your ingredients start to clump together. The result should feel almost like damp sand while building a sandcastle. Scoop the mixture into whichever mold you’re using, and pack it down tight. The back of a spoon works perfectly to press your mixture in place. Let your bath bombs dry for at least 24 hours, and they’ll be ready to go! Be sure to like The Beauty Bar on Facebook and follow us on Twitter and Instagram for more beauty tips and tricks! Kaila is a west coast wanderer nestled in the heart of Washington State. She describes herself as an online shopping extraordinaire, lover of life, and makeup hoarder. She also enjoys doing DIY projects, sharing a good laugh over coffee, and spending time with her daughter, Ava. You will most likely find Kaila behind a camera lens, exploring the great outdoors, or writing for her new lifestyle blog, lovekaila.com. 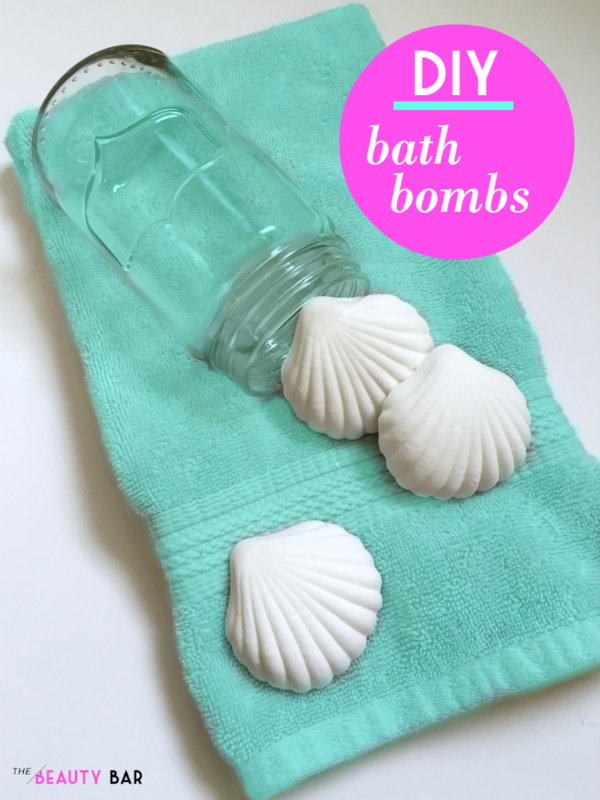 DIY Bath Bombs recipe from The Beauty Bar. This is a homemade bath bomb recipe from a beauty bartender at The Beauty Bar. It is also a dupe for LUSH bath bombs. I'd love to hear how they turn out for you, Miki! I'd like to try this out as a dupe for some Lush bath bombs! Great idea to include the little ones! Can't wait to hear all about the fun color/scent combinations you come up with. Can you use grape seed oil instead of coconut oil? is do you need a more solid oil like coconut. I had the same issue, and it actually can be ordered on Amazon in a 1 lb bag for pretty cheap! Thanks for the tip Lisa Howard! Try Cream of Tartar...WAY CHEAPER with same effect as the citric acid! MomtimesTwo.... the cream of tartar will not produce a lot of fizzing it will however help to hard on your bath bombs. you can not substitutes citric acid. it is a fundamental ingredient. you will want to spray witch hazel or 70% (or higher) rubbing alcohol and mix the crap out of the ingredients to avoid activation of the baking soda and the citric acid. Funny I should find this after researching Mermaid party ideas and visiting lush yesterday with my little one. My question is this: how do you get the "shooting rocket" inside the bubble bomb or how would I add the seaweed and make sure the bath was as emerald blue as the store bought one yesterday. 80 dollars for 8 bath bombs is a bit over the top for an already pricey party. Pleasehp if you can. Also do you know how to do the break apart bubble bars? The ones that make bubble baths? And from a safety standpoint I see the word "acid" and I want to see what safety recommendations you might have such as not hurting skin or burning it. The citric acid is from elmons, it reacts with the baking soda to give the 'fizz'. They neutralize each other. It's just like making a model volcano for a school science fair. Citric acid is used as a preservative in canned foods so if you're worried there's no reason to be. Use Cream of Tartar instead of Citric Acid...far cheaper with the same effect. Enjoy! Citric acid is the chemical name for Vitamin C, so it is not dangerous. cream of tartar will only hard on your bath bombs you will not get them to fizz excitedly like a proper bath bomb. you can not replace citric acid as it is a fundamental ingredient. to get that lovely colour you are asking about you need to purchase a colourants like lakes that come in blue 1 and yellow 5 that you can mix and get gorgeous greens. or you can purchase green mica (make sure they do not contain ultramarines as they will reek in your bath bombs) you will need to use an emulsifier like polysorbate 80 so the mica mixes into the water and disperses... if you don't then your mica will leave a ring around the side of your tub. and float on the surface of the water. The Citric Acid is completely natural and could even be consumed. I would be a little more worried about the "fragrance" and components of the actual Lush bath bombs. When I make my own I know exactly what is in them. Plus they make my skin soooo soft! I'm curious, what is the shelf life for these? Kiah and Alex, it's recommended that you use your homemade products within about 2 weeks! Since there are no ingredients included for preservation, these don't last as long compared to store bought. Coconut oil doesn't go rancid, either. Citric acid is in the canning area at Walmart top shelf. Do you use regular food coloring? If so does it stain your tub and skin? Heres something to use for coloring. I used regular food coloring, I believe by Betty Crocker, and had no issue with it. Thanks for reading! Thesoaper - What do you use to color yours if you don't use Food Coloring? A John how would you use it to add to a bath bomb? You can use soap coloring... it won't leave residue. You can get it anywhere there are soap making supplies. Great idea Dani, thanks for reading! thanks for the recipe on these bath fizzies. my family is visiting and I will be excited to hand them out then maybe go visit the store and see what the pros do. How many does this recepie yield? Hannah, it depends on the size of bath bombs you are wanting to make. I made 4 medium sized bombs from this recipe! Personally I only have experience with this recipe using silicone molds. I believe it's much easier to get the bath bombs out once finished! I ordered mine off of Amazon, and have also seen some at Target. Good luck! Hello! If you use plastic molds use a dab of coconut oil, just rub it on the mold before you put your bath bomb mix in, it makes it easy to pop them out of the mold! Buy the plastic Christmas Ball that snaps together for crafting or a snowball mold. Found the snow ball mold at The Christmas Tree Shop for $1.99 makes 6 at a time. Holiday items are on clearance at the craft stores. You can also use plastic Easter eggs ... you get an egg shape, but it's easy and cheap. Is there a brand and size silicone mold you could recommend to recreate the large size bombs? What are the best essential oils to use when you don't know the recipient's preference? And where do I get them? Any suggestions for the kids bubble bath bombs they have? What oils do you use to get the Karma smell? I believe the Karma is patchouli, bergamot, & orange. You can double check that on the LUSH website. How long do you leave the bath bomb in the mold? like 6 hours and mine were good ! This is the same recipe as I have found everywhere else, I feel no closer to making Lush quality bath bombs. Be careful with the citrus essential oils as they can make the skin irritated and in the summertime increase sun sensitivity. Keep away from the eyes! Rinse their skin well and moisturize after the bath. I followed these directions exactly. my bath bombs didnt fizz. disappointing. I found that the ratio of 1 Cup citric acid to 2 Cups baking soda, and the 1/2 cup of corn starch worked perfectly. Generally accepted amongst the bath bomb makers is this ratio. Hope this helps. Thanks so much for this! They turned out perfect with this recipe! I don't have coconut oil. Can I use something else in place of the coconut? I too find this is too much coconut oil. I've been cutting back to 1/4 cup and it works much better. Agreed, too much oil, and my bombs never dried completely because of it. Waste of product and time! When I used the recipe : ratio of 1 Cup citric acid to 2 Cups baking soda, and the 1/2 cup of corn starch this turned out perfectly! I used the advice given above about using the Crayola color drops (found at Walmart) and YESSS beautiful lagoon water...or purple..or whatever! They leave your skin feeling amazing!! did you still use 1/2 cup of coconut oil? As Unknown asked, do you still use 1/2 cup of coconut oil or do you use 1/4 as others have stated? Thanks! 1/2 cup of coconut oil is way too much! Ended up being a slippery mess. So definitely use less. I noticed on the Lush website that in their bath bombs they usually include Cream of Tartar in ingredients list. Anyone else use Cream of tartar? I've seen it offered as a 'fizzing' agent as an alternative to citric acid. What food dye do you use? Can I use Mccormick food dye? I have liquid coconut oil can it be used instead of melted hard oil? Bulkapotherapy.com has an 8 pound bag for $15.84! Cheapest I have found by far! Hope that helps! I made these and they are lovely, however now that they are dry, they are cracking!! Any suggestions? how much will it cost for all the products in total? We'll see if they actually work properly or not when dry. Thanks for the recipe, even though I basically disregarded it! Another recipe says when using the 3 inch stainless steel bomb mold to use Kaolin Clay to hold it together or it will fall apart? Has anyone tried the 1c citric : 2c baking soda : .5c cornstarch with the large molds? Do they hold together? How many bath bombs did this recipe make? How many round bath bombs can be made using the above measurements pf ingredients? so i made a batch tonight according to the recipe above and I added 1cup of epsom salt to the mix....i got 6 bath bombs from the recipe and all the ingredients were purchased between walmart and aldi stores in my home town for rather cheap. if you want to have a 3" ball type mold i would suggest wish.com for them ($2 each). took me three weeks to finally make them due to waiting on my molds...but they turned out great! all together i spent about $40 on supplies but most of them can be used for more than 2 batches. total cost for 6 bath bombs was $7.50 vs $7.50 each at lush! Just made my first batch of these! So excited for them to dry so I can try them out! :) If you're using liquid food coloring, I would recommend mixing it into your wet ingredients. It clumps up and doesn't disperse well in the dry ingredients. But they turned out great so far! Thanks for the recipe! I see a couple other comments about them crumbling, but dont see any answers. Has anyone figured that out? Can I substitute citric acid with cream of tartar? I saw a similar recipe but I didn't know if it would still turn out? Is it ok to use gel food coloring for this recipe? I love this! Thanks for the recipe! The only thing is the cornstarch didn't dissolve all the way, could you tell me what brand you used? Was it yellow? Thanks! Cornstarch is a fine, white powder. Cornmeal is coarse ground corn and is yellow. What are the best scents to use? I have some essential oils but I was looking to make the "love spell" scents and other scents that essential oils wouldn't really work for. I use essential oils too but have recently used fragrance oils from Nurture Soap and Indigo Oils and they are awesome. I believe the both have the Love Spell dupe scent. So I made a first batch with no coloring and they turned out lovely! But then my second batch was too "soft". They felt pretty oily and soft so they did hold shape of the mold like the first batch but when I touched them they fell apart really easy. I used red food die in those. So third batch did the same thing as the second one only didn't hold the shape of the mold. And used red and blue to make purple. Anyone know what I did wrong, why they aren't like the first batch? 1/2 cup of oil will make your bath bombs too heavy to float, 1-2 tbsp is all you need. In order to obtain the right consistency, add water to a spray bottle with food coloring and spray the mixture and incorporate until you get the wet sand feeling. My coconut oil made my orange oil bath bombs smell like coconut bath bombs.....any other oils work? Maybe this comment has been made, but, shouldn't the recipe be only 1/2 TEASPOON coconut oil and not 1/2 cup??? That may make more sense! I used 1/2 a cup and there was a thick film over the water and in the tub after from the coconut oil! They are amazing, but I don't really want to bathe in oil. Did you find any solutions? This is the first recipe I've found that I didn't have to keep adjusting the amount of ingredients in it. Finally! Thank you! This was a great recipe and I really liked it, however when I used the bath bombs, and once they had dissolved there was a film of coconut oil across the whole bathtub. Did I do something wrong, use too much coconut oil, or is this normal? A 1:1 ratio as shown in the recipe is known as an embed recipe. This will help make your bombs shoot, spin or change color depending on placement of your embeds. A 2BS:1Cit ratio is a good bath bomb recipe and standard. I also would advise against using food coloring. It will again your tub and possibly stain your skin! Look into using lakes for your colors and make sure what you are buying is indeed skin safe. Happy crafting all! I use Witch Hazel instead of coconut oil. 4-6 teaspoons add till barely moist. Want to try with the Epsom Salts next. Bath bombs are so much fun to make. I made some Himalayan salt bath bombs recently. They turned out great! I am definitely going to try your recipe as well. I basically like Himalayan salt very much. I use it as bath salt and really love it. You can visit the given website of http://www.ittefaq.co/ to know more about Himalayan salt. What are some good essential oils to use in these? The blend is then compacted into a form, shower bombs are generally formed into circles (subsequently the name "bomb") anyway as they are put into molds they can be found in a wide range of shapes, for example, hearts. Configuration is truly straightforward and a decent easy to understand interface. I did this recipe yesterday and am SUPER HAPPY with the results! I've tried other recipes with no avail. I used a small cupcake mold and packed down the mixture really tightly. Then I added a layer of epson salt and pressed that on top of the mixture, placed in the oven at 145 degrees for about 40 min then let them sit overnight. In the morning I put them in the freezer for an hour and they popped out of the mold perfectly! Question when I make my bath bombs round or other they don’t harden all the way and end up expanding after I have them sit to dry or put them in freezer they do the same thing. What can I do to fix them. I noticed your recipes doesn't use Cream of tartar, or kaolin clay without those can the cornstarch able to hold the bomb. What about milk powder, natrasorb, SLSA, SCI etc....i see many use it.